There are so many things I need to do right now! I go through the list in my head, adding things as I think of them, and suddenly it becomes an endless book. A List of Infinite Tasks. I get overwhelmed just thinking about it. There are all these things I want to accomplish in my short time on this planet, and, yes, I am referring to my crafty things. One thing I have been itching to do is quilting. Well I can almost check that off my list! Check this baby out! This is a play mat to put on the floor for my little nephew. He's just learning to roll and his tummy time mat is too small and slippery for him to get that fat little body turned around. 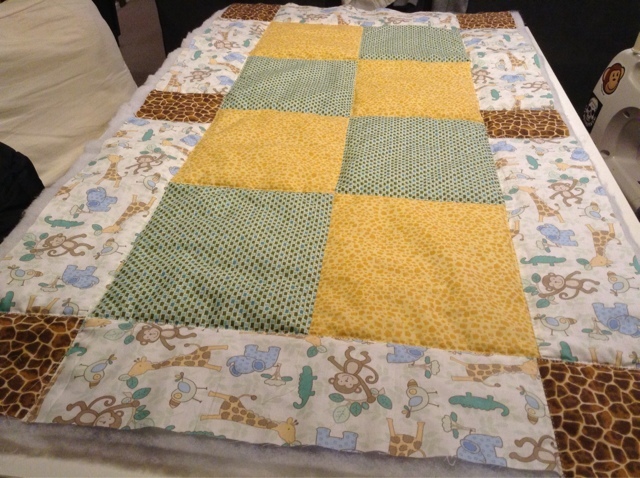 He should have a much easier time on this fun jungle theme quilt! I still have to bind off the edges. Is that the right term? Bind off? My brain goes to knitting terminology right away. It doesn't know any better. Anyway, I can't wait to see that baby wiggle around on this! I am forever working on this little man's sweater. I swear I'm almost done! It just needs a collar and to be seamed up. He will have it before winter is through! Next comes a hat for him. That will be a fast knit. And after that another baby blanket. He loves being wrapped up and cuddled and is currently favoring his great Nana's knit blanket. My mother requests another to be made. The yarn is already in my possession.